Surface Pro and Windows tablet PC users have an amazing array of great software at their disposal and most of it costs only a fraction of what you will pay for a license from Adobe or Corel. EDITOR'S NOTE: I can't believe I haven't updated this post since September 2014. Spring 2015 brings the regular round of 3d application updates! Many of you have asked, so I have noted where programs support multitouch gestures. Houdini FX 14.0.291 - does not run. Program loads, but objects do not display. Touch not supported. Although the GT-220 shipped directly from China, it only took two days to reach me in Los Angeles. 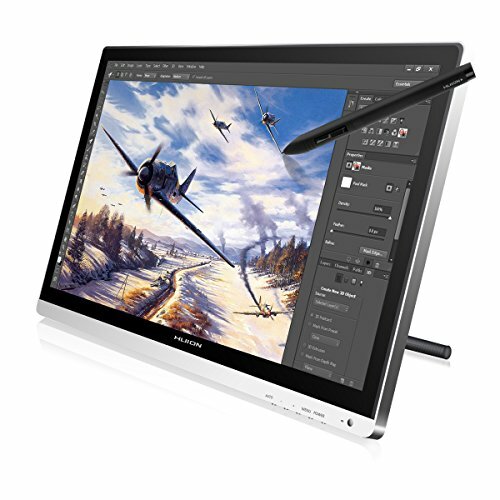 Huion’s new 21.5-inch Interactive IPS Pen Display, the GT-220, is close to a dream come true. This is the third pen display I’ve tested after Yiynova’s MVP-22U (v2) and Monoprice’s Interactive Pen Display (which is functionally the same as Huion’s earlier model, the GT-190). My issues with the Monoprice are well documented but mainly had to do with its inferior TFT display. The Yiynova is a much better device, but aesthetic and build quality issues leave a lot to be desired. The GT-220 is attractive, thin, very well constructed, has excellent viewing angles and most importantly a fantastic 2048 level pressure range. In fact, I was so giddy after unboxing my GT-220, hooking it up, installing drivers and testing with Manga Studio that I was tempted to post my review immediately. If all you use is Manga Studio or Clip Studio Paint, you can stop reading right here and just break out your credit card. (See the convenient Amazon link below. Seriously, this blog needs your support). But I know you read my reviews for my blunt assessments of the products I test. And as much as I love the GT-220, it’s definitely not without its flaws. Counter-clockwise from upper left, the Huion GT-220 ships with an HDMI cable, two USB pen charging cables, an HDMI to VGA adapter, a USB cable, two rechargeable pens with cradle, installation discs with instructions for Mac and PC, power supply, power cord and VGA cable. I would trade one pen and USB charging cable for a DVI cable. Eight replacement nibs and an extractor ring are tucked inside the pen stand. The pens have a nice rubberized finish and two buttons. Connections are located on the underside of the GT-220. From left: VGA, DVI and HDMI outputs, the power connector and the USB port. Because of their unfortunate placement, the cabling is easily tangled with the VESA stand. As the monitor angle is adjusted, you have to be careful to clear the cables so the stand can lie flat on your work surface. Also located along the lower right edge are the monitor adjustment and power buttons. You'll have to hold your hand flat against your desktop to access the buttons. It's unfortunate they weren't moved to another edge. Of course, except for power, you won't need to access the display settings very often. With its slim design, the lower edge of the GT-220 screen is only 1.5-inches from the bottom of the monitor. This means you'll have to either place the monitor right at the edge of your desk or prop your palm against desk edge in order to draw along the bottom of the frame. The GT-220 comes with a very welcome screen protector that dramatically improves the drawing experience while also reducing glare and fingerprints. The protector can be easily removed or adjusted, but it's only held in place by four pieces of double-sided tape. It's an unsightly and low-tech solution. It will be interesting to see if the adhesive loses its tack over time. The specs say the GT-220 tilts 70-degrees from almost fully upright to nearly flat. But my unit (above) seemed to have nearly 85-degrees of movement. It's very difficult to adjust the angle without first jiggling cables out of the way. Otherwise, the monitor stand will wobble as you apply pressure on the screen. Having already experienced the setup of the Monoprice and Huion W58 pen tablet, I was prepared for what to expect from the installation experience. But even so, it didn't go 100% smoothly. It's essential when installing Huion drivers to install them before connecting the monitor via USB. In my case, since I already had the GT-190 version installed, I decided to give them a whirl just to see what would happen. When I plugged in the USB, the pen was immediately recognized and I could run the driver's control panel and even calibrate. But when I tried using Manga Studio, the pen was off by several inches. I guess that the GT-190 driver is tuned to its 1440x900 resolution and doesn't understand the 1920x1080 GT-220. I uninstalled the older driver and rather than use the installation discs, headed for the Huion website and downloaded the latest version I could find there. 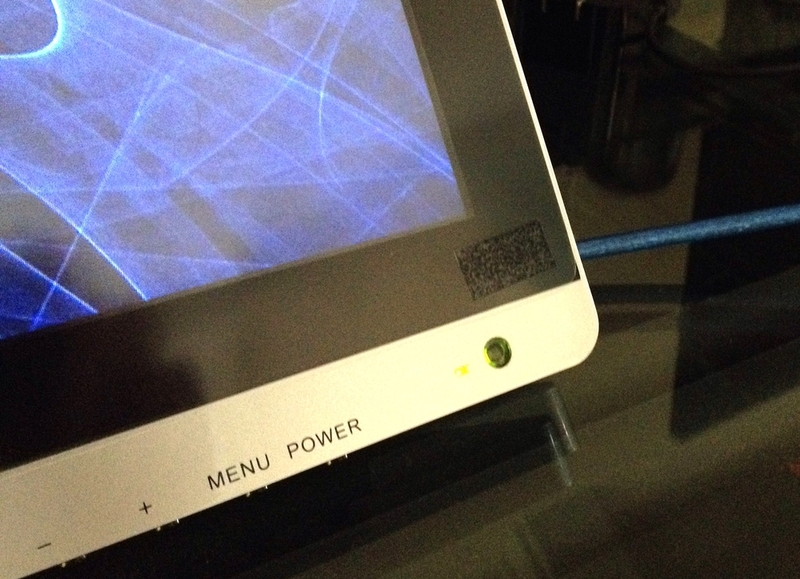 Once installed, the driver creates a desktop icon called Pen Display and a system tray item. When the USB is plugged in, double clicking the system tray icon opens the driver's control panel. The PenDisplay control panel looks just like the panel from other recent Huion devices. Require Admin must be selected first in order to calibrate the GT-220. The calibration tool only has five points, concentrated in the center of the display. This hasn't been an issue on either the Monoprice or Yiynova, but on the GT-220, I'm noticing more edge parallax than I'm accustomed. Hopefully future driver updates will increase the calibration points which would help reduce the cursor drift from the display center to the upper left corner. But after all is said and done, the pressure range in Manga Studio is phenomenal. It's hard to make out in this image, but my lightest strokes begin in the very upper left corner of the canvas. After running the calibration tool and adjusting pen sensitivity, drawing is wonderful. The screen protector has a satiny finish much better suited to the pen's hard plastic nibs than bare glass. Edge parallax is a bit of a problem, especially in the upper left corner of the display. In Manga Studio, I found myself relying on the Display Application Menu icon located just above the New Canvas tab rather than going up to the file menu. The cursor and the pen tip are perfectly aligned just below the command bar, but at the menu bar, there's about a quarter-inch offset. I can deal with it, but it does require a pause to concentrate to target the menu items. UPDATE 8/25/14 After working with the GT-220 for several more days, I've become more aware of the device's parallax issues. Besides the cursor drift problems I cite above, the pen display also has a significant gap between the glass and the screen. This separation is more pronounced as you view your work from an angle. In Manga Studio, there is never less than an 1/8-inch gap between the cursor and the pen tip, so inking precisely requires more concentration than I'm accustomed to on Windows tablets. Huion tells me that they're working on improving this via a driver update. Moving on to Photoshop CC 2014, it took some Googling to learn that the software now requires a PSUserConfig.txt file entry in order to work with any Wintab tablet. No matter what I tried I couldn't get pressure sensitivity in Sketchbook Pro 7. This experience bodes ill for all tablet users as software migrates to RealTimeStylus or Microsoft's INK API. Device manufacturers are going to probably need to issue new drivers for older devices or software developers are going to need to come up with better backward compatibility. I also tested with Krita Desktop and Paint Tool SAI 1.2 and both worked fine. Corel Painter 2015 recognized pen pressure, but as on other tablets I've tried (including the Surface Pro 3), some brushes have their initial activation pressure set so high many strokes are not recognized. As of this writing I haven't tried hooking the GT-220 up to a Surface Pro. I'm reluctant to do so with the Surface Pro 3 because I have too much software on it that requires the N-Trig Wintab driver. Installing the Huion drivers will overwrite any Wintab driver on the system. So if you want to use the pen display with a tablet pc, software has to have an easy way to switch between RealTimeStylus (TabletPC) and Wintab. Very few applications handle this as elegantly as Manga Studio/Clip Studio Paint. As I wrote at the outset, the Huion GT-220 isn't perfect and depending on your software preference may not be useable at the moment. But if you're a Manga Studio/Clip Studio Paint user, it's a great asset despite its few kinks. At the dawn of Windows 8, before I started the quest for knowledge that led to the creation of this blog, I dreamed of finding a penabled all-in-one from one of the major OEMs like Dell or HP. I still can't understand why that hasn't happened. Perhaps it will be up to Microsoft to make this dream device. I can't help but fantasize about a 22+-inch Surface Pro all-in-one with a Huion digitizer. Now that would be real dream machine. 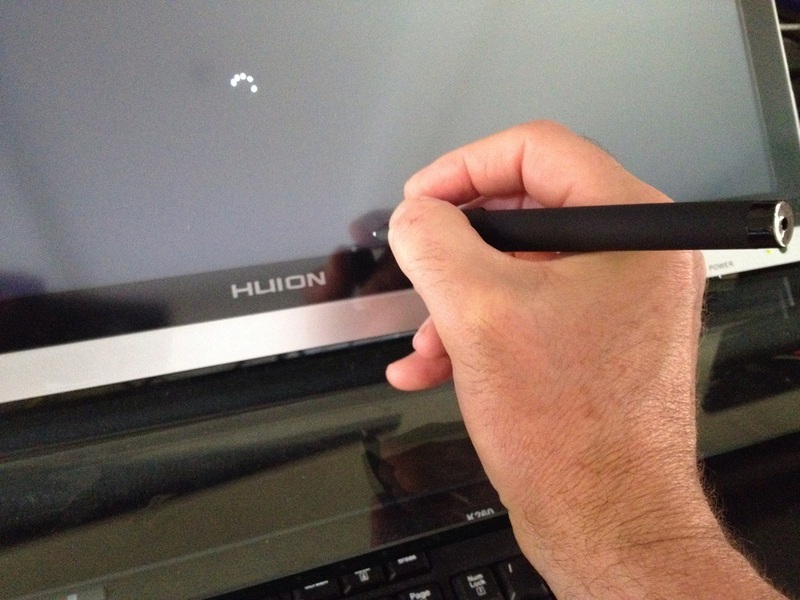 In the meantime, the $899 Huion Interactive IPS Pen Display GT-220 will turn any pc into the next best thing.